At this time of year I love to go apple picking. There are several orchards nearby. When my son was young we would make a day of it. At the orchards they set up fun activities for the kids. You can take a free hayride to the pumpkin patch where everyone searches for the perfect Halloween pumpkin. The hayride takes you through a path that has been decorated with cartoon characters and Halloween scenes. At some point during the ride a man in a gorilla suit will jump out of the corn stalks and scare you. You can pick gourds also and they sell multi colored dried corn and other decorations for the Fall. Next we would go to pick apples. Of course you eat one right off of the tree as you go picking. Fresh picked apples are so crisp, juicy and flavorful. My favorite varieties are the Stayman-Winesap and McIntosh for baking and homemade applesauce; and the Stayman-Winesap and Gala for eating. I used to (used to is the operative phrase here) make a large batch of apple sauce and can it. Family and friends would look forward to getting some homemade applesauce and I loved grabbing a jar of homemade apple sauce to have with potato pancakes or roasted chicken. The apples were so naturally sweet and flavorful no sugar was needed to make the sauce; just apples and water. Now that I wrote about it, I am thinking that maybe this year I will once again put up some jars of applesauce. The last stop of the day was at the orchard farm store. We would buy some fresh pressed apple cider, home baked pies and apple cider doughnuts. Now that I cannot eat wheat, I must bake my own pies and doughnuts if I want some. It had been at least seven year since I had an apple cider doughnut. This week I actually made a batch and they came out great! At the orchard the doughnuts are always fried, but I just do not like to fry foods and with gluten free dough being so soft it is easier to use doughnut shaped baking pans and bake them in the oven. At the orchards the doughnuts are sold, plain and with powdered or cinnamon sugar on them. I used to love the cinnamon sugar ones, but with baked ones I don’t think the cinnamon sugar would stick well. The plain baked doughnuts are just the right sweet for me, however I saw a photo of doughnuts with a caramel glaze and had to try the glaze. All I can say is that you can go into a sugar coma from the sweetness of the glaze. I cut the sugar down to less than a quarter of what was called for, but it was still way too sweet for my taste. All I could taste was overwhelming sweetness with a hint of caramel, but the doughnuts looked great. Here is a link to the glaze recipe if you want to try it. Doughnut with overwhelmingly sweet caramel glaze. 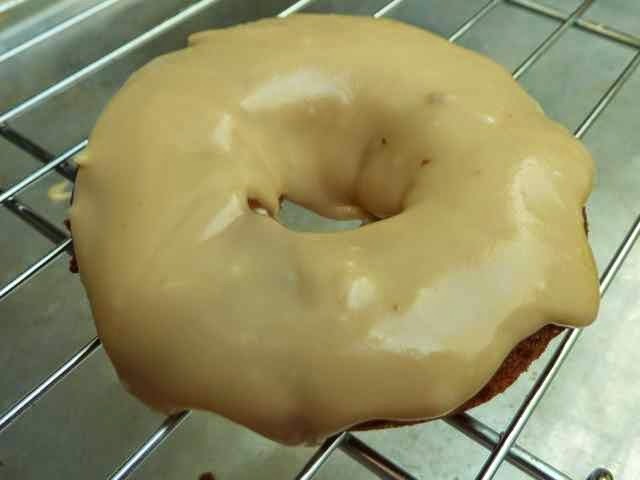 This recipe was adapted from my pumpkin spice doughnut recipe, replacing the pumpkin and milk with apple cider and omitting some of the spices. You can taste the cider in the doughnuts and I love the soft cake like texture. 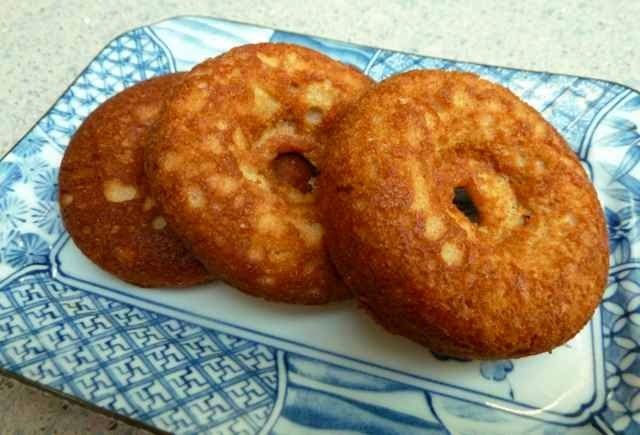 They came out as good as any wheat cider doughnuts that I can remember. You could hear my wheat eating friends mumbling through bites how good the doughnuts were as they were gobbling them all up. Preheat oven to 350°. 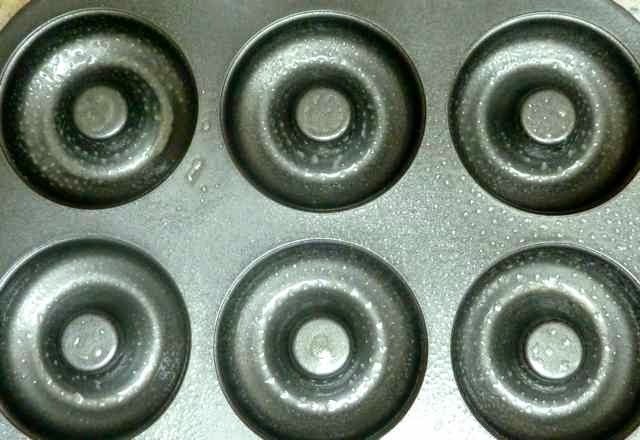 Grease doughnut pans. Doughnut pan sprayed with cooking oil. In a small bowl add the apple cider, eggs and vanilla, mix well. Set aside. Alternately add 1/3 of the flour mixture and then 1/3 of the cider mixture to the sugar mixture. Beat in well after each addition. Repeat until all the flour and cider mixture is used. Place batter into a large plastic baggie and cut the tip of one corner large enough to allow batter to squeeze out in to the doughnut pan. Or use a disposable piping bag and cut off the end. This is a photo of my pumpkin spice dough which is thicker than this recipe. 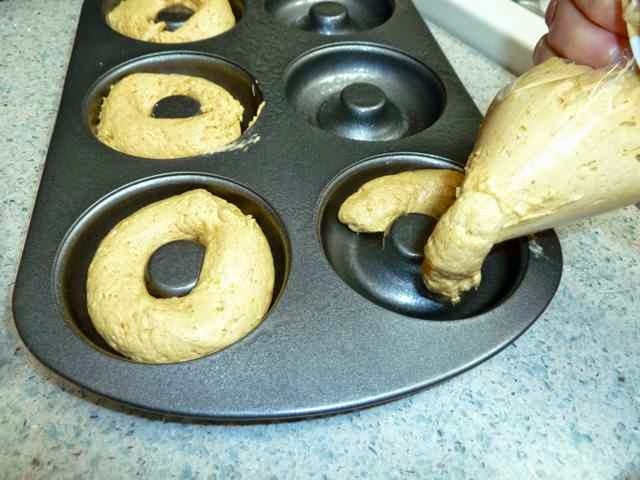 to pipe the batter into the doughnut pan. Squeeze the batter into the doughnut pans. Batter should reach just under the top of the pan. Bake in the center of the oven for 20-25 minutes until the doughnuts spring back when touched lightly with a finger or when a toothpick inserted in the thickest part comes out clean. With baked doughnuts one side is a bit flat. Wait 1-2 minutes and then invert the pan to loosen the doughnuts and allow them to cool on a rack. If they cool too long in the pan they will stick. 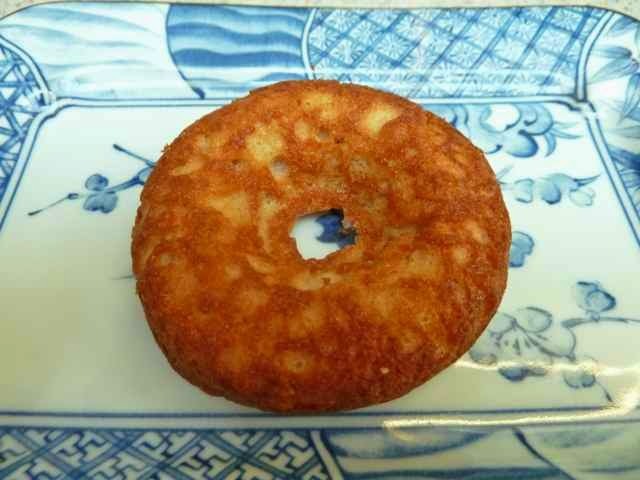 Baked doughnut on a plate. Upside down it looks more like a doughnut. These are best eaten the day they are made. They will keep, well covered, at room temperature for two more days. Freeze the freshly made doughnuts for longer storage. Just let them thaw at room temperature for about half an hour before eating. GLUTEN FREE APPLE CIDER DOUGHNUTS Makes about 16 doughnuts. 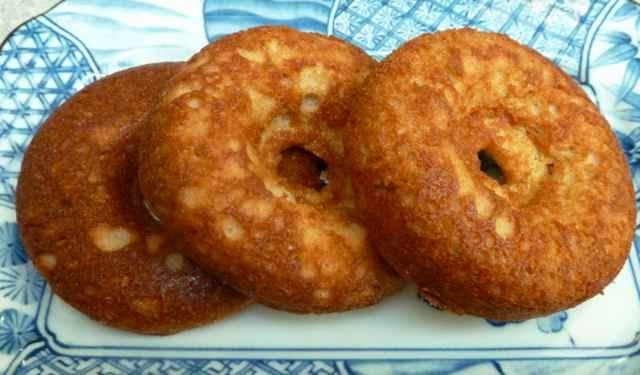 Ingredients 1 cup Sorghum Flour ½ cup Chickpea Flour ½ cup Tapioca Flour 1 tsp. Xanthan Gum 1 tsp. Salt 4 tsp. Baking Powder 1 tsp. Cinnamon 1 cup Sugar (I use evaporated cane juice.) ½ cup/1 stick/4 oz. Unsalted Butter (for Dairy-Free use ¼ cup non-hydrogenated margarine such as Earth Balance and ¼ cup of non-hydrogenated shortening such as Spectrum) 1 cup Apple Cider 2 large Eggs 1 tsp. Pure Vanilla Extract Directions Preheat oven to 350°. Grease doughnut pans. 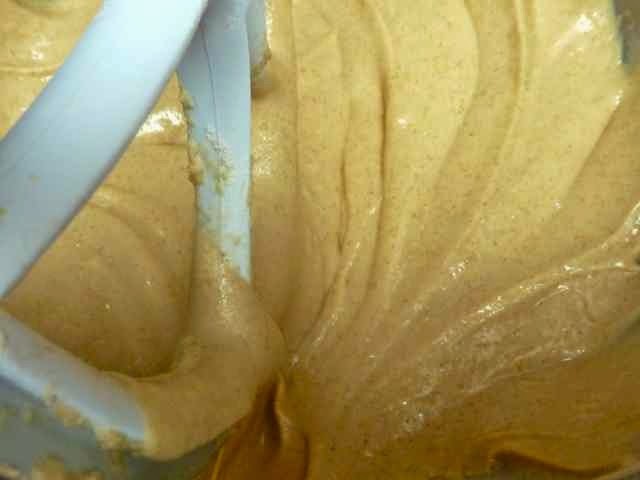 In a medium sized bowl add flours, cinnamon, xanthan gum, salt and baking powder. Mix with a whisk until well blended. Set aside In a small bowl add the apple cider, eggs and vanilla, mix well. Set aside. In a separate bowl or the bowl of a stand mixer cream sugar and butter or margarine until fluffy. Alternately add 1/3 of the flour mixture and then 1/3 of the cider mixture to the sugar mixture. Beat in well after each addition. Repeat until all the flour and cider mixture is used. Place batter into a large plastic baggie and cut the tip of one corner large enough to allow batter to squeeze out in to the doughnut pan. Or use a disposable piping bag and cut off the end. Squeeze the batter into the doughnut pans. Batter should reach just under the top of the pan. Bake in the center of the oven for 20-25 minutes until the doughnuts spring back when touched lightly with a finger or when a toothpick inserted in the thickest part comes out clean. 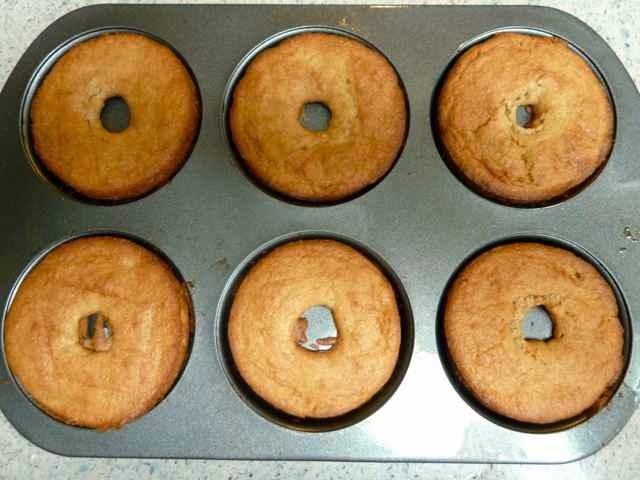 Wait 1-2 minutes and then invert the pan to loosen the doughnuts and allow them to cool on a rack. If they cool too long in the pan they will stick. These are best eaten the day they are made. They will keep, well covered, at room temperature for two more days. Freeze the freshly made doughnuts for longer storage. Just let them thaw at room temperature for about half an hour before eating. MY FAMOUS POTATO SALAD - GLUTEN FREE OF COURSE!